Happy new year to all of you speedsurfers. It was a great start to the year with sessions across western Europe and many people scoring PB's within the first 3 days. West Kirby fired and many of you will have already read my report on it. For myself it was a great start as I received my new boards from Ian Kraft (Surfkraft) who is the UK agent for Exocet. The boards I have chosen to start my new quiver off are; the RS4, their full dedicated slalom board 69cm wide and 111l; and the SL Sport 78cm 129l. These boards are just the start, I intend to complement them with the smaller RS2 and RS1 (90l, 59cm and 80l, 54cm) once I have saved up enough pennies. The reason for the board choice I made is this year I am entering the slalom and representing Exocet, Hot Sails Maui, Black Project fins and Windtek (local shop in Weymouth). The SL Sport is one of the boards that I reviewed last year, and I really enjoyed using it, it is a detuned slalom board that they call 'freerace'. A wolf in wolfs clothing more like, it is basically their older Warp with a nice red sanded back to carbon finish. For such a large board it is great fun to ride, and feels fast, gybes fast and will get me out with a nice 8.8m Hot Sails GPS in the lightest of winds. The RS4 is a thing of beauty as well, my second session on it took me to just under 33knots (bear in mind that I have only peaked over 33 knots on 5 different sessions ever, and always on smaller kit). It is light, rides low/flat to the water giving a constant feeling of powered up control. I wrote my first feelings about the board in an article here. Exocet RS4 69cm 111l board. These boards will be powered by the Hot Sails GPS in sizes 8.8 - 8.0 - 7.3 - 6.6 - 6.0 - 5.5 which I think is a perfect spaced quiver, allowing for pairing of alternate sizes. What I mean is when the 8m gets too much then the 6.6 will be perfect etc, of course this depends on conditions but I do think it gives a lot of options making the choice of sail easier. The fins I will be using are Black Project in sizes from 50cm down. My current quiver is shown in the picture, I need to add to this over time with some more Speed (Type S 26.5 and 24) and to fill in a couple of gaps for the Slalom/Race (Type R 50cm). 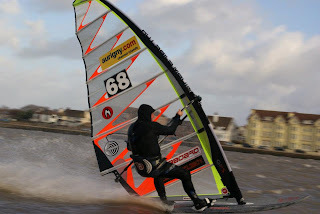 They also do a Type X which is their custom Asymmetric speed rated fin, in sizes 40, 45 and 50 knots for Port or Starboard, I cant wait to have a go on one of these later this year, Pete Young scored a PB peak just over 48knots last week using their Type X 45. This now brings me to the point of this article. What I want is some advice on how to use this to develop and train my Slalom technique before the British Slalom series starts at Easter Weekend. I have never raced slalom, I have only tried racing friends on my local salty lake so I am starting this from scratch. I am going to run a series of articles as I get to know the kit, and how my technique is developing over time to suit the Hot Sails GPS and Exocet Boards and how to get the most out of them. This will be both in a review format and a critique of my development in terms of speed and slalom sailing. What would you like to read about? What questions can I answer that would tempt you to have a go on this kit and try it out? Feel free to ask either through the comments on here or email me - redsurfbus@gmail.com.